If your dog has been behaving abnormally and seems to be scratching at his or her ears quite often, they may be suffering from a common canine problem- the dreaded ear infection. Some people are surprised to find out that dogs are able to get ear infections, but they actually tend to get them far more often than adults. Just like adult ear infections, those in dogs can be quite painful, but also cured. It may be possible for you to immediately assume that your dog is suffering from an ear infection, but it is important to seek medical advice. Ear infections can become serious if not properly treated, they can also leave your dog in a lot of discomfort. Although Google might have some of your answers, it isn’t going to be the best outlet to help your furry friend. When you visit the vet be sure to have some history on your pet readily available. A lot of it might seem like common knowledge, but most of us can’t remember what we ate yesterday let alone our pet’s history. 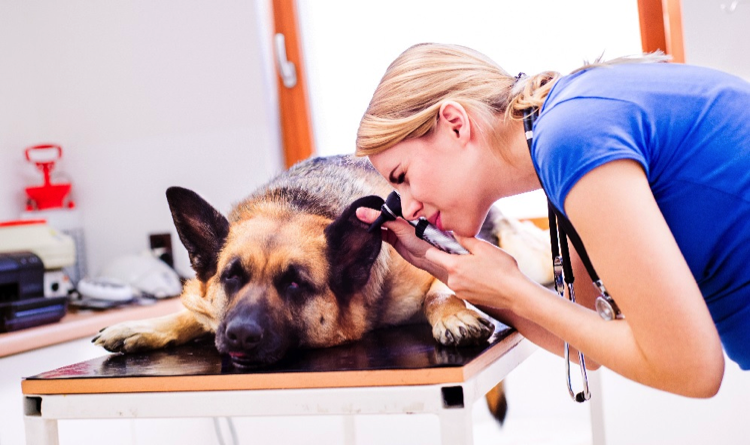 The vet will examine your dog to better understand the issue. If your dog is in severe pain, or is not tolerating the examination, it might be necessary for sedation to be used. The vet will most likely observe both ears to see if one is the culprit, both, or neither. How Will the Ear Infection Be Treated? Your vet will thoroughly clean your dog's ears, and we mean thoroughly. If you thought taking a Q-Tip to your own ears was a sight for sore eyes, brace yourself. In addition to this your furry companion will probably receive an antibiotic and a pain killer. You may be asked to continue cleaning your dog’s ears at home. The ear infection will typically subside in 10-30 days. Some cases are considered chronic and can last much longer. You can always take steps to decrease the chances of an ear infection occurring. Be sure to frequently clean your dog’s ears and ensure fluid is dried up after baths, swimming, or playing in any water. The most common cause of ear infections is water build up. Water in the ears creates a perfect environment for bacteria to thrive. Ear Infections may never occur to your dog, or they may happen all the time. It is never too late to start taking precautions to help combat this pesky infection.